Sundara Spa Wisconsin Dells is really a great place to get away from it all and let all your stress slip away. 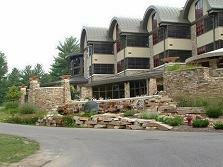 But they have more than just the spa, offering some of the nicest overnight accommodations available in the Dells. You can also just visit for a day trip for use of the spa facilities. No matter how long you stay, you're likely to find the experience to be extremely relaxing and beautiful. The spa is located on twenty-six acres featuring some of the most beautiful natural scenery in Wisconsin. Upon arriving you will be greeted by the tall pines and beautiful stone outcroppings that were formed by glaciers millions of years ago. We really like how the originality of the architecture blends in with the natural surroundings and landscaping. When you are planning your trip it is probably best to keep in mind that the resort is for those over 18 years of age. Amenities at Sundara Spa Wisconsin Dells include a fitness studio, relaxation lounge, heated outdoor infinity pool, open air fireplace and much more. Plus with your stay you can do the spa's Purifying Bath Ritual as many times as want. The bath does close at nine pm, so remember to make an appointment early. There are also many different salon and spa services available, from holistic skin care, massage therapy and everything in between. Accommodations at Sundara Spa Wisconsin Dells include twenty-six suites and twelve separate private condos. There are two styles of villas which are the lifestyle villas and villa suites. The lifestyle villas are larger than most people homes at 1,700 square foot each. We did not get a chance to take a tour but we did see the floor plans. These units are tucked away in the piney forest area and just adjacent to the golf course. We made reservations to celebrate our anniversary in May of last year and stayed in the Amoda villa suite. The suites are roomy and comfortable, featuring a large feather bed, as well as a fireplace and spa type bath area with an awesome rainfall shower head. The showers by themselves are a grand experience with six separate shower heads. We really enjoyed sitting by the fireplace and just simply relaxing which is something we rarely take the time to do. We also had a screened in balcony which was great and turndown service each night. Room service was excellent as well, There's even a town car that'll take you to local restaurants, if you decide to eat out or take s side trip. Breakfast was included with our weekday package and it was very good. The breakfast included eggs, granola, potatoes, fresh fruit, yogurt, danish rolls, muffins, bagels with cream cheese, juices and hot beverages. It’s all you can eat but you sort of feel like you should not stuff your self when your on an outing like this. Incidentally, the cuisine here has been noted in popular travel magazines. They also have complimentary tea, coffee, juice and snacks whenever you like and you can always order of the menu. The chefs are always willing to accommodate your taste and for food allergies or special diets. We really enjoyed having our lunch and drinks out by the pool area which never was to crowded on the weekdays. Maybe next time we will set up an intimate dinner on our balcony. There is a nice bar and a fire pit out by the pool. We ate lunch there both days and dinner one night. We also made several trips to the outside hot tub and heated infinity pool near the fireplace area. It was a great place to relax and was never too busy. We found weekdays to be more quiet, relaxing and not over crowded. Sundara Spa Wisconsin Dells offer what seems like hundreds of options when it comes to spa treatments. We both did of course indulge in a full hour massage and took advantage of the Purifying Bath Ritual experience which is included with your overnight stay. In fact you can do the Bath more than once … so we did. The experience includes a scrub shower, the steam bath, a cool down shower and jumping between the hot and cold tub. We were told this helps circulation in the body. We found it to be quite exhilarating and a relaxing. To cap it off you can take it easy in the relaxation room or step outside and enjoy the heated pool and fire pit area. It seemed funny at first but everyone wears these big plush comfortable robes and slippers everywhere. So you can just kind of hang out and spend the whole day in your robe, listening to soft pleasant music or getting closer to you significant other. .
We found the staff at Sundara Spa were always helpful, and we found the room, buildings and grounds to be very clean and tidy. The tips are automatically figured in, so you won't have to worry about under or over tipping, or who should receive a gratuity. I would think that the Sundara Spa Wisconsin Dells would be a good choice for an anniversary, Valentine's Day, honeymoon, romantic getaway, or any other occasion you might want to celebrate. The prices do seem a bit steep at first, but the end result of our romantic trip was definitely worth it.